The human body contains about 10,000 trillion cells, each of them a watery bag of chemical reactions, salts, proteins and genetic material surrounded by an oily layer called the cell membrane. This membrane forms a physical barrier to retain the cell components and also allows the environment inside a cell to be tightly regulated so that the conditions are ideal for cell metabolism. But the presence of the membrane also means that in order to move chemicals into and out of the cell specialised pores are needed. These form channels through the membrane that can carry salts (charged atoms known as ions) and also larger molecules such as sugars. The majority of these membrane channels are selective for specific substances and can even be opened and closed electrically like the cellular equivalent of a remote-controlled garage door, or by using chemical keys known as ligands. Some of the membrane channels also work as pumps, burning energy to pull in certain chemicals or eject others. The most well-studied of these is the "sodium-potassium ATPase", which works rather like a revolving door built into the membrane and simultaneously spits out sodium and pulls in potassium. A further twist is that the pump ejects 3 sodium ions for every 2 potassium ions that it pulls in meaning that, over time, the inside of the cell builds up a net negative charge compared with the surrounding "extracellular" fluid. Nerve cells (neurones) exploit this situation to transmit information at speeds reaching one hundred and twenty metres per second. This is achieved by ion channels in the cell membrane opening for a fraction of a second to allow a small number of positively-charged sodium ions to flow into the nerve cell, triggering a spike of nerve activity called an action potential. This action potential travels along inside the neurone and is periodically reinforced along its journey by other ion channels that are themselves activated by the electrical activity. The pattern and frequency of the action potentials allows nerves to send information rapidly from one part of the body to another. But what about when you tread on a pin? How is this sort of injury detected? The solution is elegantly simple. When the point of the pin enters the skin, the perception of sharp pain is caused by the generation of action potentials in pressure-sensitive nerve fibres in the dermis. The membranes of these nerve fibres are stretched, which prises open ion channels permeable to postively-charged sodium ions. The sodium entering the cells triggers action potentials, which are carried along the nerve fibre to the spinal cord. In the spinal cord these signals are transmitted to other groups of neurones, some of which connect with those parts of your brain that interpret the signals as being painful. The information is also relayed to other neurones that control the muscle groups that can withdraw your foot. The result is that, thanks to the action of ion channels, you flinch away from the sharp pin almost as fast as you feel it. But ion channels are not only essential for the nervous system to function. Indeed, life couldn't get started in the first place without a family of ion channels that spring into action at the moment of fertilisation so that, when a sperm fuses with an egg, the electrical properties of the egg cell membrane change to prevent further sperms from entering. Ion channels also provide the pacemakers that keep the heart in rhythm. With every heart beat calcium ions flow into cardiac muscle cells through specialised calcium-channels. This in turn triggers the rapid release of even more calcium from stores inside the cell (through another type of calcium channel), and this is what triggers the heart muscle to beat. In essence every cell type has a specific ion-channel toolkit to enable it to carry out its physiological functions. Predictably, given the important role that ion channels play in our bodies, a number of human diseases are directly caused by ion channels that fail to function correctly. In some cases these are the result of mutations or changes to the genes that encode the ion channel proteins themselves. Alternatively, similar problems can occur if the proteins upon which ion channels depend for their function fail to work properly. Cystic fibrosis, epilepsy and certain heart rhythm problems (arrhythmias) like "long QT" syndrome are examples of this phenomenon. It's not all down to genetics though because some food-poisoning bacteria have evolved to exploit our ion-channel vulnerability to good effect through the production of toxins that can trigger diarrhoea by interacting with ion channels in the cells lining the intestine. All of these factors mean that ion channels are prime targets for therapeutic drugs, for example during surgery as the target sites for anaesthetics and neuromuscular blockers, in the management of neurological and psychiatric disorders such as epilepsy or schizophrenia, and in cardiology where ion-channel-blocking drugs are used to control heart rhythm. Surprisingly, however, most of the drugs currently in use are based on serendipitous discoveries - something worked so we used it only to discover the mechanism later. But now we are entering an era of "rational design", the pharmacological equivalent of a made-to-measure suit designed with a specific receptor in mind. The concept of an "ion channel" evolved in the 1950s through the pioneering work of Alan Hodgkin and Andrew Huxley in Cambridge and Bernard Katz at University College London. They revealed how the movements of sodium and potassium ions power action potentials in nerve cells, work that won Hodgkin Huxley a Nobel Prize in 1963. Subsequent work in the1960s and 1970s in different labs around the world lead to the identification of the first ion channel protein: the acetylcholine receptor from an electric ray (Torpedo califormica). By the early 1970s there was sufficient evidence about the channels to guess that a very small current (just a few picoamperes, which is about 1/100-billionth the current that flows through the bulb of your desk lamp) must flow through each channel. However, the "noisiness" of the recording methods used at the time was too large to allow such tiny currents to be directly measured. That changed in the mid-1970s when German scientists Erwin Neher and Bert Sakmann succeeded in measuring ion currents through single channels using a new technique that they had developed. Called "patch clamping", this method, which is now used all over the world, allows scientists to record the flow of ions through an individual channel and in real time. In recognition to their contribution they were awarded the Nobel Prize in Medicine in 1991. More recently, advances in molecular genetics have made it possible to clone individual channels and thus relate ion channel function to the protein sequence from which they are constructed. Another major breakthrough came in 1998 when Roderick MacKinnon, at the Howard Hughes Medical Institute, USA, used X-ray crystallography to resolve the first atomic structure of an ion channel - the bacterial KcsA potassium-channel from Streptomyces lividans. MacKinnon was awarded the Novel Prize in Chemistry in 2003. But what is the structure of an ion channel? 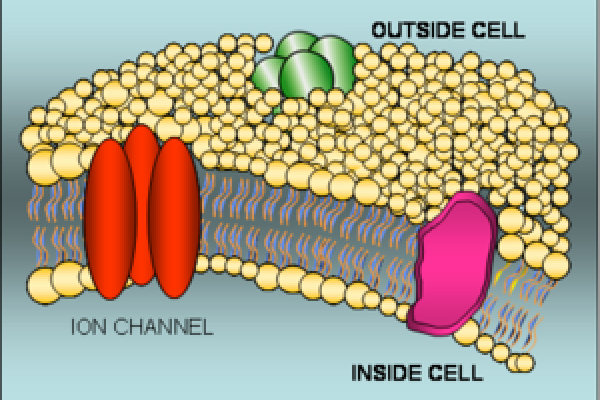 Ion channels are made up of protein molecules that assemble symmetrically to form a water-filled cavity that bridges the cell membrane. In some respects ion channels can be regarded as "excitable molecules" because they can specifically respond to certain stimuli. Different ion channels have different sensors that enable them to detect different conditions and hence they are classified depending on their sensing mechanisms. Some of them respond to changes in the membrane potential; these are known as voltage-gated ion channels. Others respond to small chemicals (ligands) that bind to specific sites within the protein; these are termed ligand-gated ion channels. The channels that respond to deformations or stretching of the membrane such as when you tread on a pin or listen to music are called mechanosensors. The channel response or activation, whatever the stimulus, is called gating and involves a series of molecular movements or conformational changes within the protein that opens the pore. Intriguingly, ion channels can also select between ions so oen form of channel will permit just the passage of chloride ions whilst another allows through sodium. This is an intrinsic property of the pore, which allows specific classes of ions to flow through at very high rates (up to 106 ions per second), while hindering the flow of others. On the basis of this selective permeability, ion channels are classified as potassium-channels, calcium- channels, sodium-channels and so on. The question regarding ion channels nowadays is how they open. What are the exact molecular movements within the ion channel protein that lead to the pore opening and ions flowing through? Because conventional biochemical methods measure the average activity of thousands of channels, it is not possible to observe the heterogeneities in the dynamic movements of what may be key aspects of their behaviour. In order to answer this question, we need to be able to study the behaviour of ion channels one at a time. That has, so far, been achieved only with single channel path-clamp recordings. However, these examine only transitions between open and closed states; they cannot probe the associated structural changes in the protein that underlie the opening and closing mechanisms. Similarly, crystal structures provide detailed information about the protein structure, but they are only snapshots of one among the many configurations that the channel can adopt. However, recent progress in optical fluorescence techniques has made it possible to directly observe single biomolecules (like ion channels) in action. These advances have opened a new era in bioscience called "single-molecule nanobioscience". One such technique is total internal reflection fluorescence (or simply TIRF) microscopy, developed by Daniel Axelrod at the University of Michigan, USA, in the early 1980s. Based on the optical phenomenon of total internal reflection, this technique allows us to observe the behaviour of single biomolecules in real time both in vitro, and in living cells. The molecule to be studied needs to be fluorescent, but thanks to progress in this area it is now possible to fluorescently label nearly any biomolecule (including ion channels). The biggest advantage of TIRF over other conventional fluorescent microscopes is that it uses a special type of illumination, known as an evanescence wave, to illuminate only a tiny section (around a hundred nanometers) of the sample, which may be the membrane of a living cell. Fluorescence coming from other parts of the sample (those we are not interested in) is rejected, allowing thus single molecule detection. TIRF microscopy has already yielded unprecedented insights into many cellular processes such as protein folding, enzyme catalysis and how protein motors move. Now many labs around the world are using the technique to study ion channels in action. It's early days yet, but this technique is certain to shed new light on the workings of these miniature membrane machines. And by allowing scientists to simultaneously watch a channel in action whilst also measuring the ion currents flowing through it, this technique promises to usher in a new era of ion channel insight!